09:12 AM - CWilson13 mentioned amsdadtodd in post Finally got my Garg! 09:46 PM - amsdadtodd mentioned Hilde in post Pooping in the same place - what happens in the wild? 10:44 PM - amsdadtodd mentioned Gossamer in post Should I put my Leopard Gecko on a diet? 12:07 AM - Gossamer mentioned amsdadtodd in post Should I put my Leopard Gecko on a diet? 03:31 PM - amccan mentioned amsdadtodd in post Welcoming a new baby girl! 12:13 PM - amsdadtodd mentioned amccan in post Welcoming a new baby girl! 05:23 PM - amsdadtodd mentioned Hilde in post MBD- Metabolic Bone Disease. What can I do?? 04:36 PM - amsdadtodd quoted CWilson13 in post Help with Weight of my Leo please? 09:21 PM - CWilson13 quoted amsdadtodd in post Help with Weight of my Leo please? 12:43 PM - amsdadtodd quoted Gao in post What kind of boyfriends should I get for my girls? 05:04 PM - amsdadtodd quoted Gossamer in post Should I put my Leopard Gecko on a diet? 07:12 AM - Elizabeth Freer quoted amsdadtodd in post Should I put my Leopard Gecko on a diet? 03:53 PM - 6duckie6 quoted amsdadtodd in post Infection? Hard lump behind front leg? 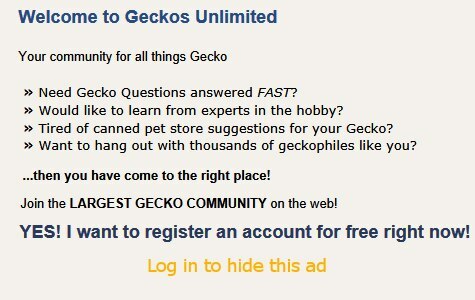 12:52 PM - amsdadtodd quoted JessJohnson87 in post `Do I have a correct list of what my leopard gecko will need? 12:33 PM - amsdadtodd quoted Elizabeth Freer in post Leopard Gecko: Soon to be new owner - Heating Query. 03:06 AM - Elizabeth Freer quoted amsdadtodd in post Leopard Gecko: Soon to be new owner - Heating Query. 11:19 PM - amsdadtodd quoted evannieandclaire in post Welcoming a new baby girl!